"Staff is amazing and very guest focused." Have a question for Pension Fidele Guest House? 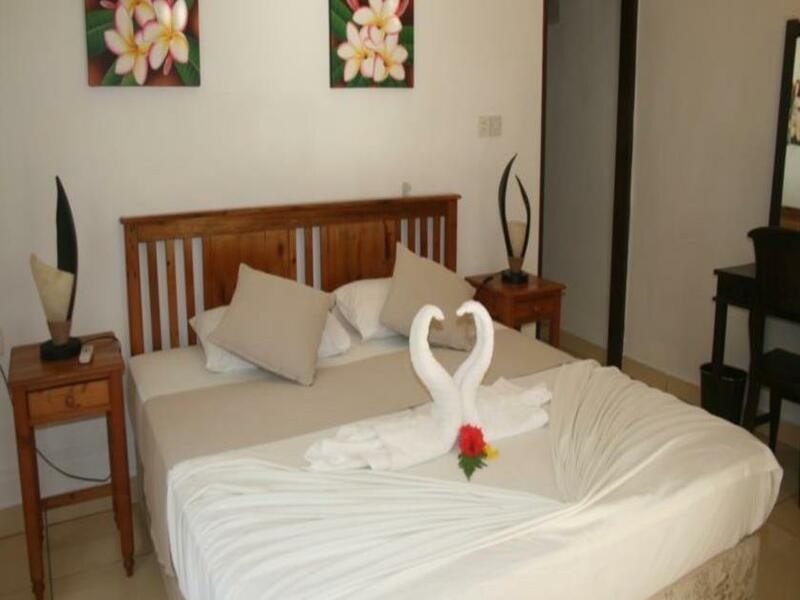 For travelers who want to take in the sights and sounds of Seychelles Islands, Pension Fidele Guest House is the perfect choice. From here, guests can enjoy easy access to all that the lively city has to offer. With its convenient location, the hotel offers easy access to the city's must-see destinations. Offering hotel guests superior services and a broad range of amenities, Pension Fidele Guest House is committed to ensuring that your stay is as comfortable as possible. Daily housekeeping, 24-hour front desk, car park, room service, tours are just a few of the facilities that set Pension Fidele Guest House apart from other hotels in the city. Step into one of 5 inviting rooms and escape the stresses of the day with a wide range of amenities such as air conditioning, desk, mini bar, balcony/terrace, telephone which can be found in some rooms. The hotel's recreational facilities, which include boats, snorkeling, fishing, garden are designed for escape and relaxation. Enjoy unparalleled services and a truly prestigious address at the Pension Fidele Guest House. "Great location, the owner is very helpful and the house is s..."
When we arrived at the property, we were told that there was no room for us, despite having paid in full for our reservation and also despite Agoda sending a reminder email to the property manager. The owner did find us some other accommodation for our stay, but it was not a nice arrival on La Digue to find out that the property was overbooked. So would we recommend this property? No because of the overbooking. You were being put in an expensive hotel at least be thankful for that! hotel is small and only two rooms is normal made from old old house. the second floor is wooden and hot. owner is greedy unpleasant women. Wery far from the seaside. Staff is amazing and very guest focused. Highly enjoyed our stay. Finding the hotel was difficult, they don't have any signs on the main road, and because of the rain the front road was floaded with no accsess. We walked around asking but the first people we asked did't know the hotel. Finally we find it and the owner appeared and show us the way. This was not a big deal for us but i recommend to ask at the jetty before trying to find the hotel by yourselves. Saying that, the hotel was nice, the room was clean and big enough with a shared kitchen and living room, a nice garden and very kind owners. Nothing to complain about. It was close to the main road.La Digue it's a very small island so everything is close. Get a bike a go around. Résidence sympa pas loin de la jetty et d'anse source d'argent. Josette a été de bons conseils pr notre séjour. Positiv: Pension liegt etwas im inneren der Insel, somit ist es nachts sehr ruhig. Es wird jeden Tag geputzt, Klimaanlage funktioniert. Wir waren in einem der Zimmer in Haupthaus mit eigener Terrasse. Direkt hinter unserem Zimmer war einer der Bungalows. Hat uns nicht gestört in dem Bungalow hätte ich aber nicht wohnen wollen, da man direkt die Hausrückwand vor der Nase hat. Wir hatten Selbstversorgung und konnten uns in der Küche Teller und alles was man braucht nehmen. Verbesserungswürdig: Die Vermieterin vermietet die Zimmer. Viel mehr Kontakt besteht nicht außer man fragt spezifisch etwas nach. In anderen Gästehäusern war das genau das was es ausmachte um auch noch etwas mehr über die Insel und die Leute zu erfahren. Insgesamt ist es aber eine hübsche Unterkunft und eine gute Lage um die Insel sowohl mit dem Fahrrad als auch zu Fuß zu erkunden. Jeden Tag sehr dekorativ mit frischen Blumen geschmückt. Gutes Frühstück mit Obstplatte, Spiegeleier, Toast und kleine Küchenstücke. Freundliche Besitzerin. Fahrradverleih und Touren sind im Angebot. Nette, ruhige, etwas abgelegene Anlage mit etwas verwahrlostem Garten ( wg. anstehender Baumaßnahmen) und schrottreifen Fahrrädern. Besitzerin sehr "geschäftstüchtig". Zimmer sehr sauber jedoch wird bei jeder Abwesenheit sofort die Klimaanlage ausgeschaltet. Nicht gut bei über 30° ! La consiglio. Secondo me però il prezzo potrebbe essere un pochino più basso ma ci tornerei. Quindi consigliato! Кроме того что чисто, очень уютно, недорого, нам предложили бесплатный трансфер в порт, а когда у жены заболело горло, хозяйка - Жоржетт дала нам мед с имбирем и не стала брать плату, очень милые, отзывчивые люди, немного далековато от пляжа, но если на велосипеде - 5 мин. Очень очень рекомендую!! !